I really have no words with which to describe Hieroglyphika. That's the joke, since aside from the title you won't be finding a single written word in this game. Everything is represented using pictographs, which makes localisation a cinch for Chinese one-man developer M. Hanka. Hieroglyphika is a roguelike in the truest sense of the term - it prides itself on its mystique and leaves its audience to discover how the game's systems work. Levels are randomly generated and permadeath is a given, and you're thrown into the deep end to try and find treasure in a dark and mysterious dungeon. 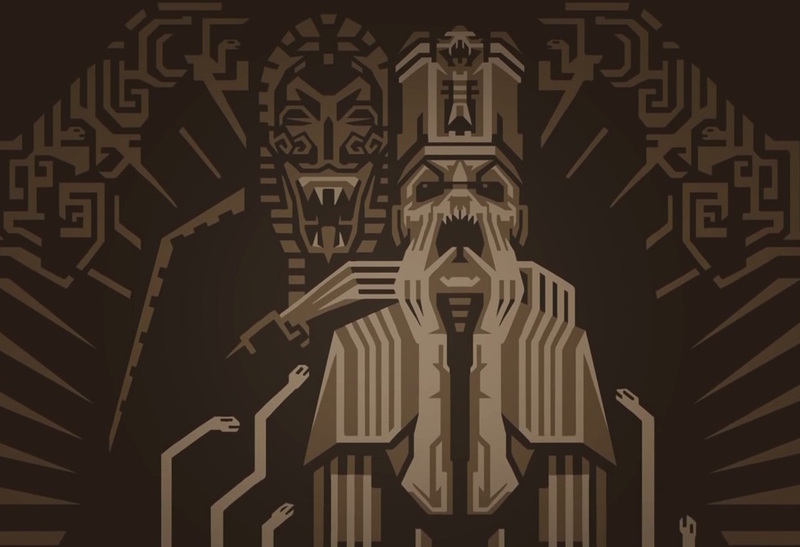 Related reading: Game Theory: What roguelikes teach us about the human condition. As far as gameplay goes, Hieroglyphika is simple yet elegant. Movement and combat are both turn based and are reminiscent of a strategy RPG - you can choose to move or attack an enemy adjacent to you. The main difference here is that compared to most other roguelikes, where everything moves simultaneously as you do, Hieroglyphika follows a turn order. This allows for more strategic gameplay as you try to line up your attacks while avoiding your opponents, but the downside is that you'll be spending a lot of time waiting for the AI to finish their moves instead of plowing through the dungeons. The end result is that Hieroglyphika's gameplay feels more methodical than most, where the consequences of your decision to move forward a single tile or wait for a tick of time can be a matter of life and death. Speaking of life and death, Hieroglyphika does not pull punches in the difficulty department. There's no instructions and no tutorial, you're expected to figure out what you can as you go along - and that means you'll be dying quickly and embarrassingly on your first few tries. Your starting equipment is terrible, your basic knife will do one lousy point of damage if it even manages to land a hit and your basic armour only lets you move one square at a time - far too slow when enemies can move three spaces in a tick of time. Enemies are varied and relentless, sporting a variety of attack patterns to keep things interesting. If you take too long, the level will spawn tough enemies to chase you down, encouraging you to move to the next floor as quickly as you can. 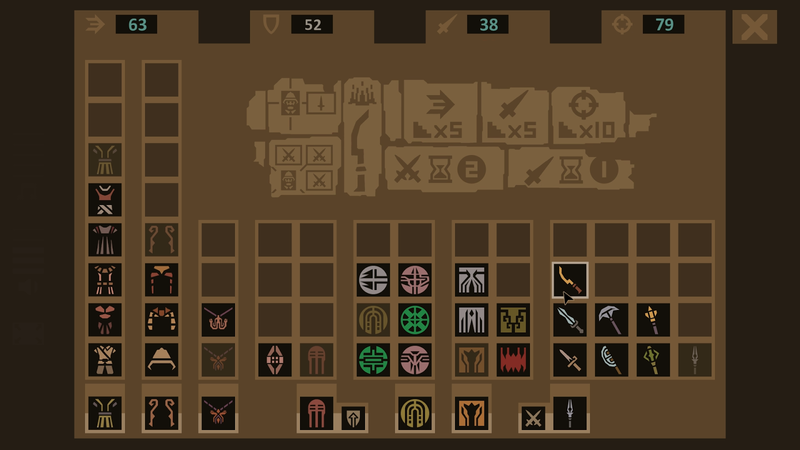 Hieroglyphika also features environmental traps which, thankfully, aren't as unpredictable as the unmarked ones popular in other roguelikes, but there's just so many of them! Every second wall will breathe fire at you, or freeze you solid, or shoot a poison arrow at you. Normally traps are telegraphed with a sprite change before they go off, but an enemy could step onto a floor switch that immediately triggers all traps in the room. Prepare to blunder around wildly for your first few runs, thinking "I was doing just fine until there was suddenly fire and ice everywhere". Hone your skills though, and you'll manage to lead enemies into traps while avoiding damage yourself and reach the end of each level unscathed. It's an extremely satisfying feeling, if I do say so myself. Exploration has been significantly dummied down from other games of its fare - Hieroglyphika's levels are simply "walk from left to right without dying". It's simple but it works - levels are narrow and obstacles are dense enough that there's never an easy path to the stairs downwards. It's less wondering where to go and more wondering how to get there. This is fantastic because it means puzzles are built right into the game's design. Similarly, the items are also built with an intricate uniqueness to further enhance the feeling of discovery. Your gear is more than just stat upgrades - your weapon influences the shape and reach of your attack while your armour determines how you can move. Do you choose to pick an inaccurate weapon which you can swing in a huge arc around you, having the chance to hit five enemies at once? Do you pick heavy armour that will block attacks but prevents you from moving diagonally? Trick question! Most of the time you don't get to choose, you'll have to make the most of whatever the random number generator gives you. Unfortunately, Hieroglyphika tends to fall apart whenever randomness starts to get involved. For example, loot is found across levels in large sarcophagi, although the placement of these are completely randomised. You really need to get gear before you have to fight enemies if you want any chance of making past the first level, even on normal difficulty, and yet sometimes all the loot is spawned behind a wall of tough monsters. Sometimes you get stunlocked by ice traps until the "hurry-up" demons catch you. 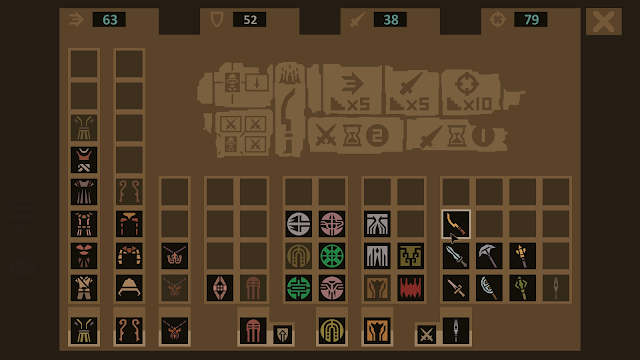 It feels difficult starting out, but once you have all your gear slots filled the game actually becomes rather easy. Enemies only take one or two swings of the sword to bring down and there are no prolonged combat scenarios. It's unfortunate that getting to this level of competency feels so luck based. 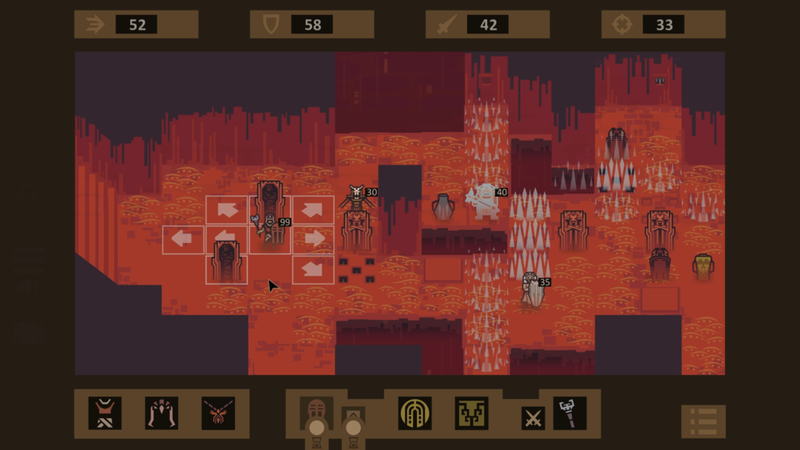 Related reading: One of the very best indie roguelikes out there on PC is Desktop Dungeons. Matt's review of the iOS version of that particular game. The environments are varied a little bit across the game's ten levels and the graphics manage to perfectly convey what they're meant to while still having an air of mystery about them. Even though most of the enemies aren't animated, they're drawn in a striking straight-line art style that makes them nice to look at. Even with the permadeath, the normal campaign can be finished easily in a matter of hours. This isn't a game with an incredible amount of content, and it's possible to see everything there is on offer after a couple of runs. The replay value is a little low since the base game is quite simple once you've figured out what the hieroglyphs mean, and there's just not enough depth to warrant repeated playthroughs. That being said though, Hieroglyphika is a fun distraction with lots of original ideas which brings the sense of wonder back into roguelikes.